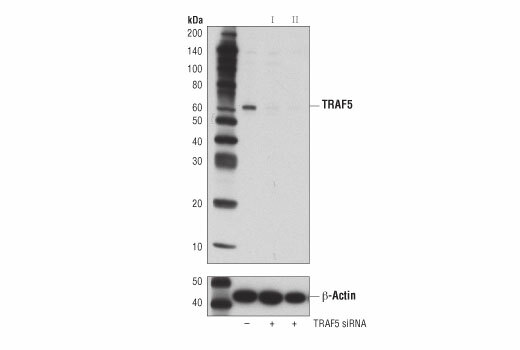 Western blot analysis of extracts from A172 cells, transfected with 100 nM SignalSilence® Control siRNA (Unconjugated) #6568 (-), SignalSilence® TRAF5 siRNA I (+), or SignalSilence® TRAF5 siRNA II #60131 using TRAF5 (D3E2R) Rabbit mAb #41658 (upper) or β-Actin (D6A8) Rabbit mAb #8457 (lower). The TRAF5 (D3E2R) Rabbit mAb confirms silencing of TRAF5 expression, while the β-Actin (D6A8) Rabbit mAb is used as a loading control. CST recommends transfection with 100 nM SignalSilence® TRAF5 siRNA I 48 to 72 hours prior to cell lysis. For transfection procedure, follow protocol provided by the transfection reagent manufacturer. Please feel free to contact CST with any questions on use. SignalSilence® TRAF5 siRNA I from Cell Signaling Technology (CST) allows the researcher to specifically inhibit TRAF5 expression using RNA interference, a method whereby gene expression can be selectively silenced through the delivery of double stranded RNA molecules into the cell. All SignalSilence® siRNA products from CST are rigorously tested in-house and have been shown to reduce target protein expression by western analysis. TRAFs (TNF receptor-associated factors) are a family of multifunctional adaptor proteins that bind to surface receptors and recruit additional proteins to form multiprotein signaling complexes capable of promoting cellular responses (1-3). Members of the TRAF family share a common carboxy-terminal "TRAF domain", which mediates interactions with associated proteins; many also contain amino-terminal Zinc/RING finger motifs. The first TRAFs identified, TRAF1 and TRAF2, were found by virtue of their interactions with the cytoplasmic domain of TNF-receptor 2 (TNFRII) (4). The six known TRAFs (TRAF1-6) act as adaptor proteins for a wide range of cell surface receptors and participate in the regulation of cell survival, proliferation, differentiation, and stress responses. TRAF5 regulates signaling through binding to the cytoplasmic domains of TNFR famly members including CD40, CD27, CD30, OX40, and lymphotoxin-β receptor (5-10). Overexpression of TRAF5 induces NF-κB activation. Research studies show that cytoplasmic aggregates of TRAF5, as well as TRAF2, are found in Hodgkin-Reed-Sternberg cells, resulting in constitutive NF-κB activation (11). Studies of TRAF5 defecient mice suggest that it plays an important role in limiting Th2 immune responses that trigger T-cell mediated inflammatory diseases and asthma (12). Further studies indicate that TRAF5 binds to the IL-6 receptor gp130 and negatively controls Th17 differentation (13). In B-cells, TRAF5 negatively regulates toll-like receptor (TLR) mediated cytokine and antibody production (14). Arch, R.H. et al. (1998) Genes Dev 12, 2821-30. Chung, J.Y. et al. (2002) J Cell Sci 115, 679-88. Bradley, J.R. and Pober, J.S. (2001) Oncogene 20, 6482-91. Rothe, M. et al. (1994) Cell 78, 681-92. Nakano, H. et al. (1996) J Biol Chem 271, 14661-4. Ishida, T.K. et al. (1996) Proc Natl Acad Sci U S A 93, 9437-42. Aizawa, S. et al. (1997) J Biol Chem 272, 2042-5. Mizushima, S. et al. (1998) Gene 207, 135-40. Kawamata, S. et al. (1998) J Biol Chem 273, 5808-14. Nakano, H. et al. (1999) Proc Natl Acad Sci U S A 96, 9803-8. So, T. et al. (2004) J Immunol 172, 4292-7.